Now you can spot a train's exact location on a Google map. Railways have just launched online application RailRadar, where one can find the exact geographical location of about 6,500 trains on a Google map on real time basis. The system enables a colour code method as trains highlighted in blue indicate those that are running on time while the red markers indicate the trains that are delayed or behind schedule. 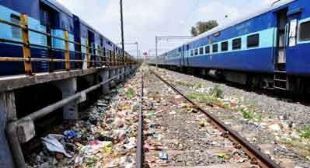 Railways operate more than 10,000 trains everyday but currently the RailRadar can spot about 6500 trains, said a senior Railway Ministry official involved with the project. He said if you click on a particular train, the map will show the exact route of the train including all the stoppages and the current location of the train on the real time basis. RailRadar can be accessed throught the railway website - trainenquiry.com. The official said to know the current running status of the train, one can either enter the name of the train, or the train number if you remember it, and the system will tell you whether that particular train is delayed or running on time. One can also see all the trains which are arriving at the station or have just departed with the name of the station. We have launched the RailRadar on a pilot basis and later on it will be a permanent feature, the official said. The new website has many new features which will not only provide the running status of trains but will also help you track the exact location of trains across the country.